Die vom bekannten Sowjetischen Bildhauer Nikolai Tomski geschaffene und über 3 Meter hohe Bronzestatue wurde 1975 als Geschenk der sowjetischen Partnergemeinde Nikopol vor dem Riesaer Rathaus aufgestellt. Dort blieb sie bis 1991, als sie infolge der nach der Wiedervereinigung eingeleiteten Entfernung sozialistischer Symbole in den kleinen peripherischen Ehrenfriedhof abtransportiert wurde. Hier befinden sich die Gräber 116 sowjetischer Zwangsarbeiter und Soldaten neben einem mit dem roten Stern verzierten Obelisk und einer Mahntafel. Wer für den Ortswechsel der Leninfigur verantwortlich war, ist bis heute nicht klar und selbst die am Denkmal angebrachte Erklärungstafel ist diesbezüglich mit einem Fragezeichen versehen: „Daher erfolgte im Jahr 1991 auf Beschluss des Stadtrates (?) die Umsetzung der Statue auf das Terrain des Friedhofes.“ Dabei handelt es sich um eine entscheidende Information für die Chronik dieser Plastik, denn durch ihren neuen Standort steht sie nun unter dem Schutz des deutsch-russischen Vertrags über Kriegsgräberfürsorge. Das bedeutet, dass die Entscheidung über ihre Zukunft gar nicht mehr in Händen der deutschen Politiker liegt, denn das Abkommen sieht vor, dass alle möglichen Änderungen bezüglich der Anlagen die Zusage der russischen Behörden benötigen. Wahrscheinlich aus Unwissenheit über die rechtliche Sachlage begann der NPD-Stadtrat Jürgen Gänsel 2012 mit einer Kampagne für den Abriss der Bronzefigur. Er wurde von vielen anderen Politikern und verschiedenen Historikern unterstützt, und wie so oft, wenn es um Lenindenkmäler geht, kam es zu einer großen ideologischen und kunsthistorischen Diskussion, die in diesem Fall jedoch völlig nutzlos ist: Für die Schleifung der Statue wäre mit einer Zustimmung von russischer Seite auf keinen Fall zu rechnen. Am Ende mussten sich also alle mit der ernüchternden Tatsache abfinden: Lenin bleibt! 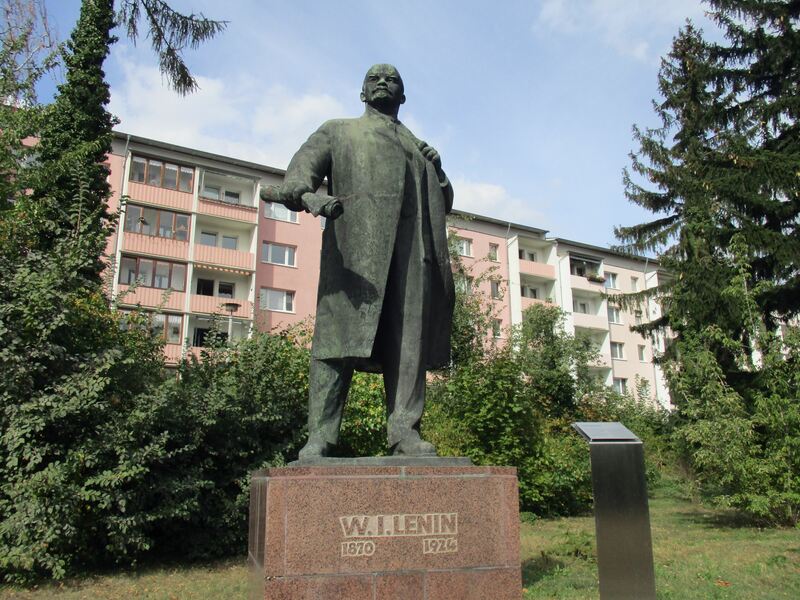 While many of the last monuments dedicated to Lenin in Germany are in danger of being demolished or crumbling away in front of an abandoned barrack, the Lenin in Riesa has guaranteed a safe and well-tended existence. 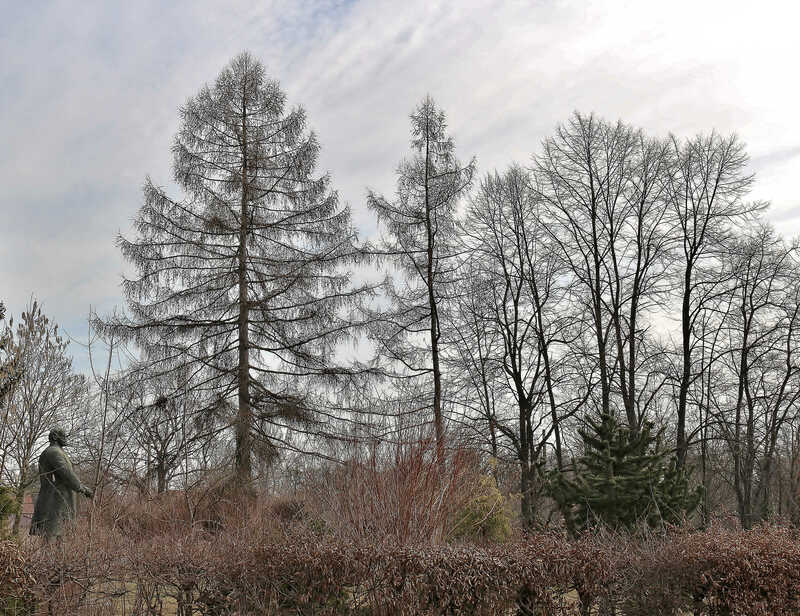 Since 1991, when the figure was moved into the little park next to some Soviet war graves, there is no longer any threat. It can stay there as heroic sentry and enjoy the sun and fresh air. 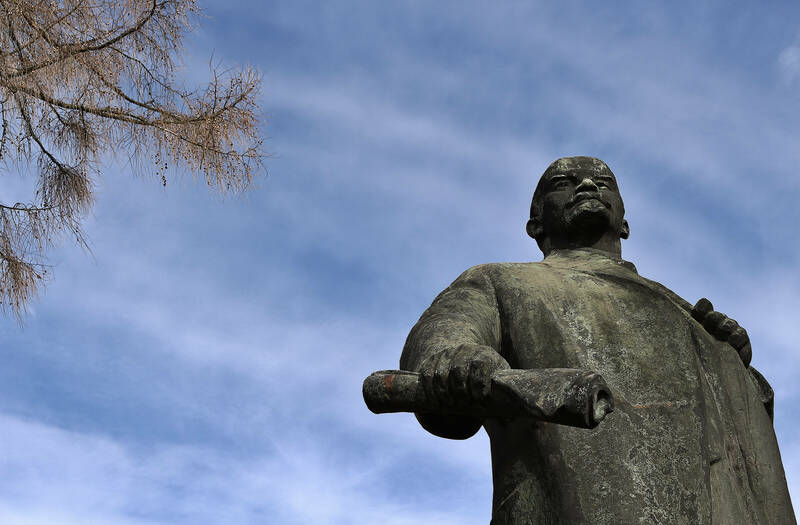 Analyzing the statue, one could think, that behind the iron expression there is a light smile on Lenin’s face: Probably he is just glad about the ironic and happy end of the story of his overhasty removal from the former Lenin Square. 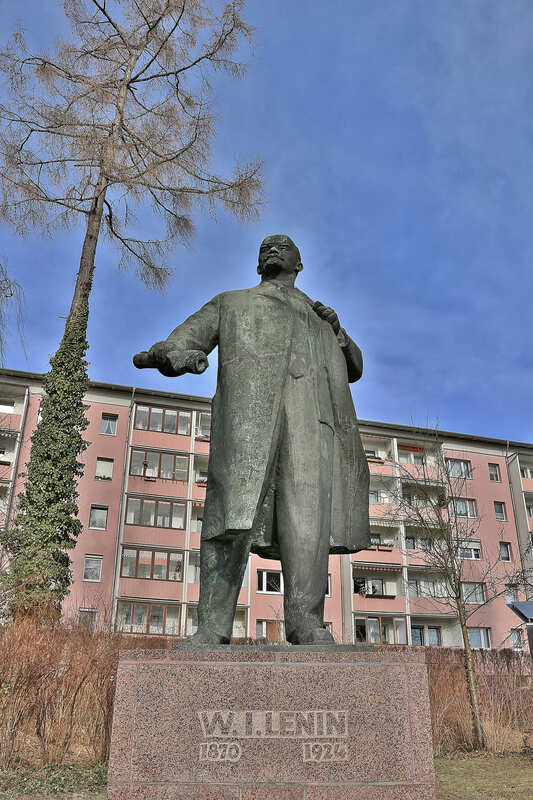 The over 3 meters high bronze-statue – made by the famous Soviet sculptor Nikolai Tomski – was a gift from the Soviet twin-town Nikopol in 1975 and was placed in front of the town hall. 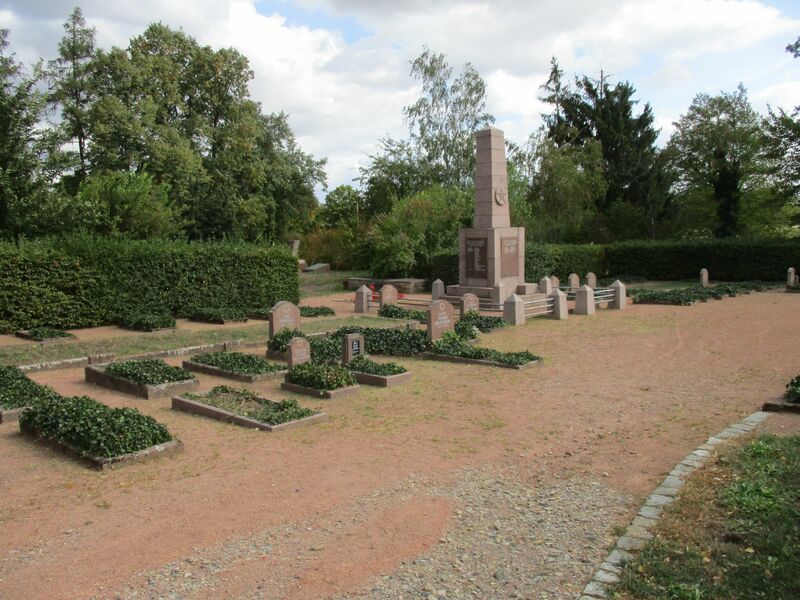 It stayed there until 1991, when as a result of the disposal of socialist symbols, which started immediately after the reunification, it was taken into the little outlying military cemetery. Next to a large obelisk, which is decorated with a red star, and a memorial plaque warning of the dangers of fascism, here rest the bodies of 116 Soviet soldiers and war prisoners, forced to hard labour. Nowadays it is still not clear who was responsible for the change of location of the statue and even the text of the panel in front of the figure provides the information with a question mark: „In 1991 following a resolution of the city council (?) the statue was moved to the terrain of the cemetery.“ And actually this is a decisive issue for the chronicle of this monument, because due to its new location it is now under protection of the Russian and German agreement for the maintenance of war cemeteries. This means, that the decision regarding its future is not in the hands of German politicians anymore, since the contract stipulates, that all modifications in the area would need the permission of the Russian authorities. 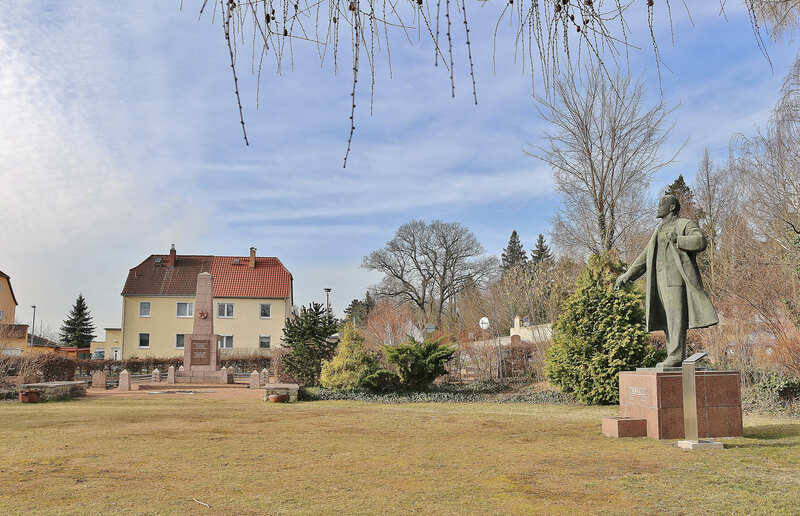 Probably due to his lack of information concerning the legal situation of the statue the local politician Jürgen Gänsel, from the nationalist party NPD, started a campaign in 2012 pleading for the demolition of the bronze-figure. 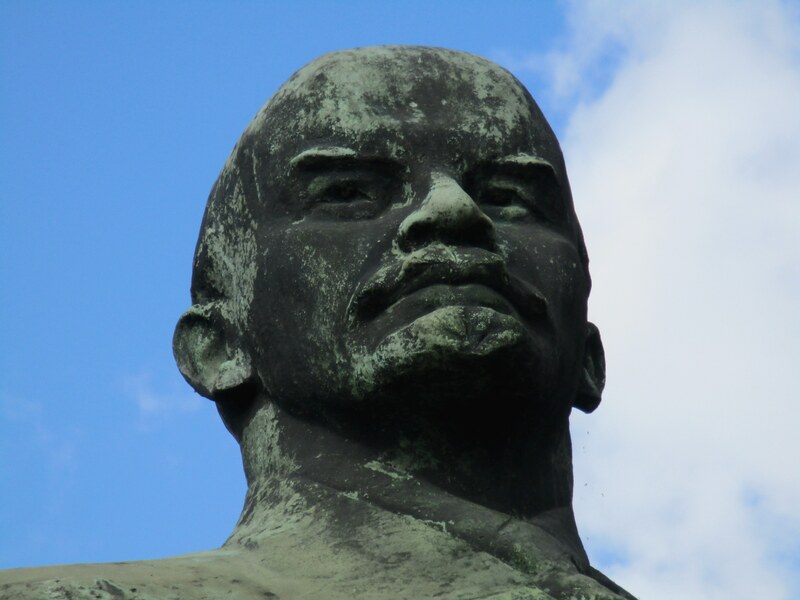 Many other politicians and historians supported him, and – as is so often the case where Lenin is concerned – a huge ideological and art-historical discussion began, which in this case, is completely useless: It’s not realistic to think, that the Russian authorities would support an initiative with the purpose of removing the monument from his actual location. 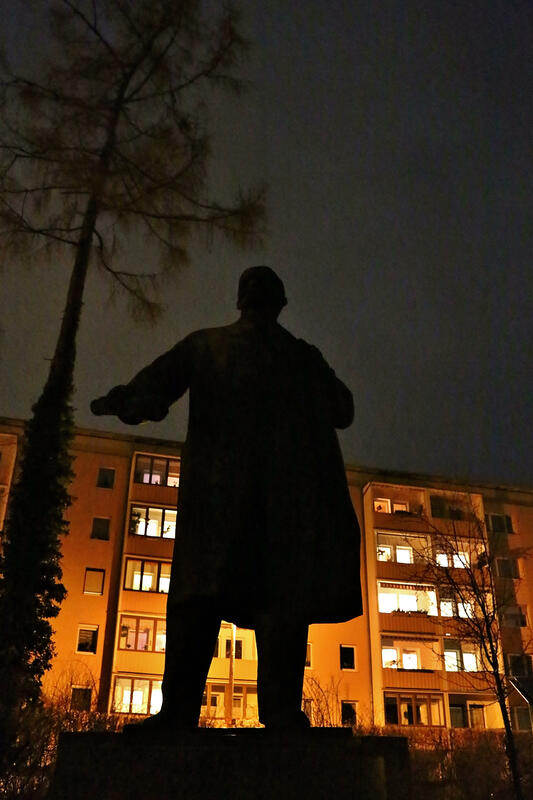 In the end, everyone had to face the fact: Lenin stays where he is!